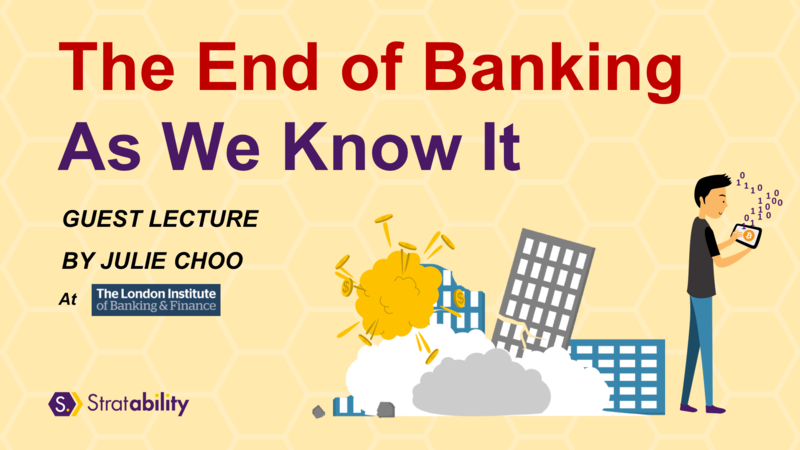 On 5 September 2018, almost exactly 10 years after the Global Financial Crisis in September 2008, Stratability’s CEO Julie Choo gives a guest lecture on the End of Banking as we know it. The lecture about the Future Operating Model of banks was highly attended by an audience of 100+ attendees at the London Institute of Banking and Finance (LIBF). Click here to access the full slide deck and video from the lecture. With all the disruption from digital technologies like AI, Blockchain and Fintech, the lecture provides a different take on the future banking value ecosystem. What are today’s banks going to look like in 10+ years time? Will they still exist, as we know them? In this exclusive lecture, Julie gives her unique insight into the Future Operating Model of banks and the wider financial services ecosystem. With over 15+ years in the financial services industry and roles spanning IT, Operations, Product Management, and business strategy including M&A… Julie gives a rare and honest business architecture viewpoint across all the different banking business lines… covering retail banking, commercial banking, transaction banking, wealth management and investment banking. Julie discusses how many traditional banks and their operating models are still a stuck in the industrial revolution. This is compared with the operating models of successful Fintech startups that have matured over the past 10 years to become the latest unicorns. What can banks do to transform their operating models to adapt, survive and thrive in the digital world? What is the future role of regulation in a digital banking ecosystem? What are the latest Fintech Trends? Which Fintech businesses are maturing? Where are the latest Fintech partnering? What is the role of technologies like AI and Blockchain? How are rising customer expectations, the cloud and API technology driving customers to define their own network-connected banking services? How will businesses co-create with customers and users in the future? In the future, will banks still as exists as we know them today? Find out more from the lecture. Full lecture slides (video coming soon) are available for access to Stratability and Strategy Journey Community Members for FREE. Click here to join. Implementing GDPR: should you use Blockchain?